Holy Trinity Orthodox Seminary invites applications for the position of the dean of the seminary, for a three-year term to begin on August 15, 2019, following the retirement of the current dean, Archpriest Alexander F.C. 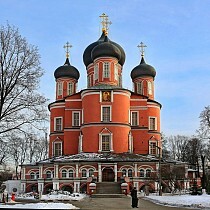 Webster, Ph.D.
Holy Trinity Seminary is a professional school with undergraduate and graduate degree programs under the jurisdiction of the Russian Orthodox Church Outside of Russia (ROCOR). The seminary is committed to continuation of the theological and spiritual legacy of the Russian Orthodox Church and to the training of future pastors and lay leaders for ROCOR and other Orthodox jurisdictions committed to traditional Orthodoxy. Successful applicants should be fully supportive of the mission of the seminary and be deeply acquainted with the theological tradition of the Russian Orthodox Church. Given the position of the seminary as an ecclesiastical institution, members of the Orthodox clergy with satisfactory administrative experience and an earned Ph.D., Th.D., or Dr. Theol. degree in theology or a cognate discipline from an accredited institution will receive preference. Fluency in spoken and/or written Russian is not a requirement, but would be an additional qualification that could enhance the candidate’s standing. Salary and benefits will be commensurate with administrative and academic experience. All applications should be directed to: Very Reverend Archimandrite Luke, Rector, Chair of the Search Committee, P.O. Box 36, Jordanville, NY 13361, or by e-mail to careers@hts.edu. Please submit your CV, cover letter, statement of intent, undergraduate and graduate school transcripts, evidence of administrative and teaching experience, and three reference letters. Review of applications will begin as they are received and will continue until the position is filled. Holy Trinity Orthodox Seminary and its Bachelor of Theology and Master of Divinity degrees have been accredited by the Commissioner of Education and the Board of Regents of the University of the State of New York since 1948 (2018 for the M.Div. degree) with an absolute charter granted in 1962.